Daniel was ordained and installed as a deacon at CTK in Feb 2019. He is husband to Rebekah and together he and Rebekah have three kids: Patrick, Erin, and Cammon. 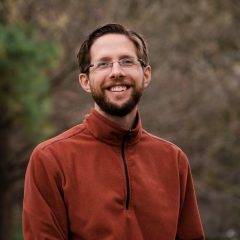 After growing up in a Christian home in the metro Detroit area, Daniel moved to Roanoke in 2004 after graduating from Washington and Lee University. He and Rebekah were married in 2006 and became members of CTK during its infancy. Today Daniel works as a project manager / consultant with a digital marketing agency. Daniel and Rebekah are grateful for the truth, grace, and love they have experienced time and again as part of CTK. They enjoy serving wherever there’s a need: whether it be organizing men’s Bible studies, hosting youth group meetings, or preparing coffee on Sunday mornings.